Play Total War: Warhammer at the PC Gamer Weekender in London from March 5-6. Click here to find out more. Total War: Warhammer rumbles on apace, which is good considering we're going to be giving you lot hands on with it at the PC Gamer Weekender this, er, weekend. 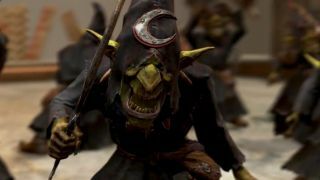 Creative Assembly have released 12 minutes of Greenskin stomping for the quest Azhag's 'Ard Armour, detailing a little more about TW: Warhammer's magic system but mainly showing Bretons reduced to paste. There's some lamenting the muted palette in the comments, which I sympathise with. On the other hand, the minute details continue to astound, befitting a game based on obsessively hand-painted miniatures: it's quite clear the Orc Boar Boyz, for example, aren't Huns with a green paint job. Total War: Warhammer goes live April 28.